It took a friend with a child the same age as Lorelei to convince me that kids would, or even could eat mussels and clams. It turns out that these little bi-valves are awesome kids' food. Bite sized bits of protein encased in pretty shells; who wouldn't love them?! Yesterday was the last day of a long week for me and I knew I needed a quick and easy dinner. I picked up a 1/4 pound of Penn Cove mussels and a bottle of wine at the market and headed home. After shoes and socks were kicked off, I put a stock pot on the stove with a drizzle of olive oil. While that was heating up over a medium flame, I quickly diced up a large shallot, sliced some fennel stalks in the fridge into 2" long pieces, and pulled some chard leaves from their stems. All of that went into the pot with a stir and a sprinkling of salt and freshly ground pepper. 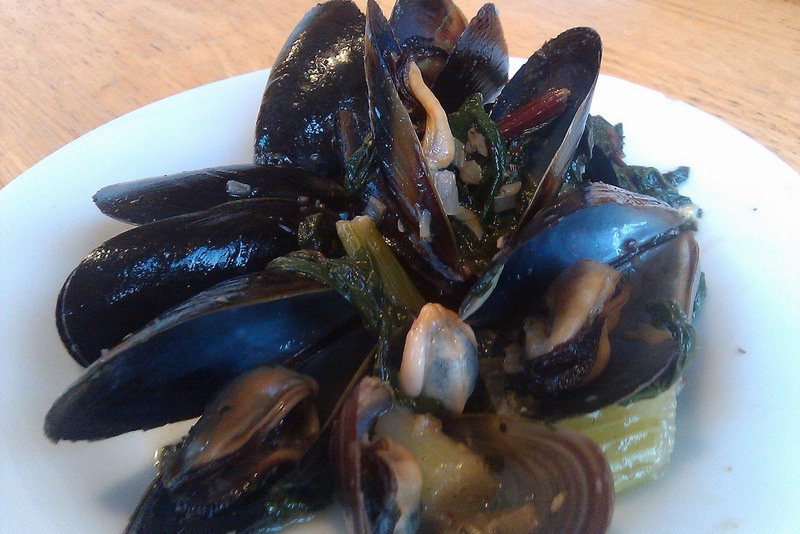 While the veggies were cooking away, I bearded the mussels and gave them a quick rinse. Leaving them pretty wet, I put them over the vegetables and gave the whole thing a stir. Then, with the heat turned up to medium high, I poured in about a quarter of a cup of white wine* and added a tablespoon of butter, stirred and covered for about 7 minutes (or until the mussels were all opened). 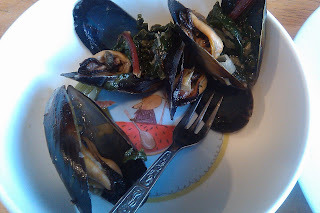 The chard was nicely wilted, the fennel stalks braised, and the mussels full of plump juicy flavor. As I lifted the lid of the pot Lorelei asked to come up and take a peek. I thought to myself, "Damn right!" In less than 15 minutes start to finish, dinner was cooked and on the table. Serve it with some baguette or other tasty bread for soaking up the broth and you've got a yummy dinner. *If you don't want to use wine, you can substitute chicken stock and a good squeeze of lemon.